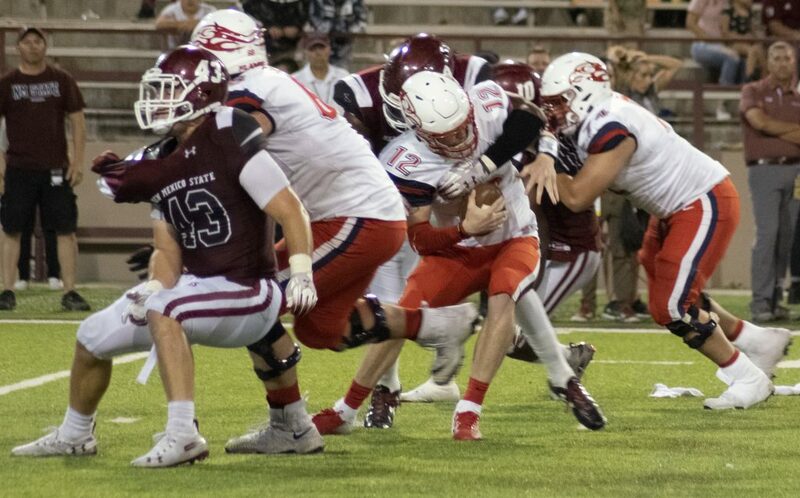 The Aggies claimed their second straight victory by defeating the Liberty University Flames Saturday in a homecoming football matchup in Las Cruces. The Aggies improved to 2-4 on the season. Liberty traveled to Las Cruces fresh off its win over NMSU interstate rival, the University of New Mexico Lobos. Liberty started the game with a dominant opening drive that was capped off by a 22-yard touchdown run. 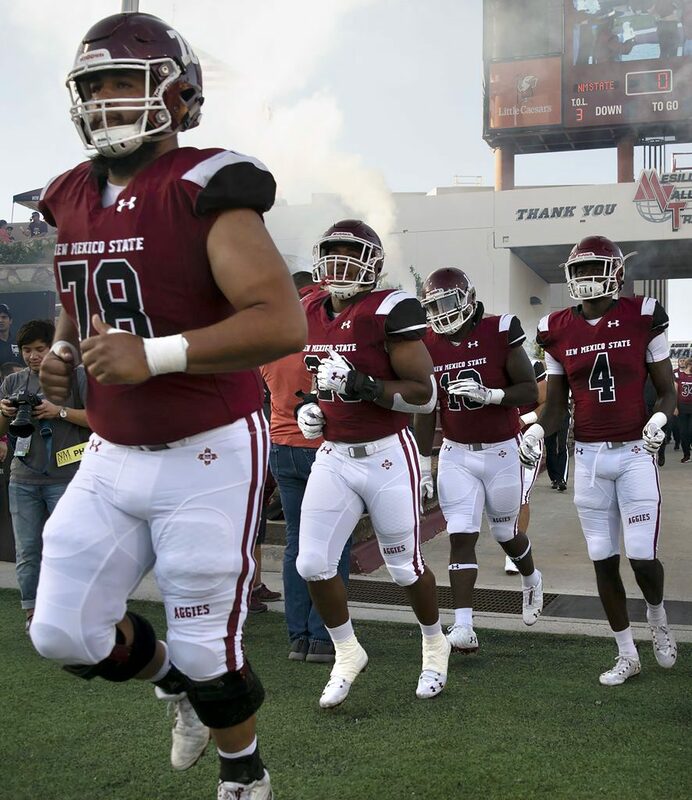 New Mexico State showed its will when junior linebacker Shane Jackson sacked the Flames quarterback, forcing a fumble recovered by junior defensive lineman Roy Lopez. As a result, junior running back Christian Gibson was able to lower his shoulder for a two-yard touchdown run, tying the game up at seven. The next seven drives would result in punts, as both teams made defense the priority of the game. The drought on offense ended when NMSU freshman quarterback Josh Adkins found junior wide receiver Anthony Muse for a 10-yard touchdown to put NMSU in front, 14-7. The Aggie defense stayed strong against the Flames, forcing them to punt the ball back to NMSU for the fifth-straight time. After the punt, Adkins completed a couple of passes for huge gains to junior wide receivers Izaiah Lottie and Drew Dan for 32 and 41 yards respectively. This would set up Jason Huntley for a two-yard touchdown run to put the Aggies up 21-7. The Aggies were able to force the Flames to punt on their next possession, but a roughing the kicker penalty allowed the drive to continue. After this good fortune, the Flames completed a 34-yard touchdown pass to dig into the Aggies lead, making the score 21-14. To begin the second half, New Mexico State started slow and was forced to punt. Liberty used a good punt return to set up a five-yard touchdown run to tie the game at 21. After a punt by each team, Adkins was able to find Dan for a 22-yard touchdown to regain the lead, 28-21. 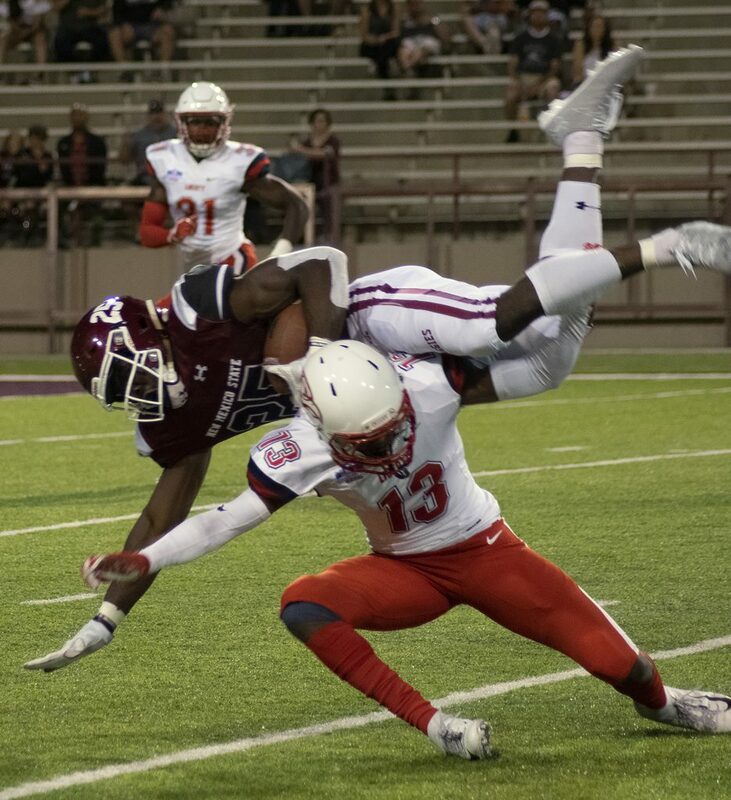 The Flames seemed to be rolling down the field, until they threw a costly interception to senior defensive back DeMarcus Owens, who returned it 53-yards to put the Aggies in great field position. 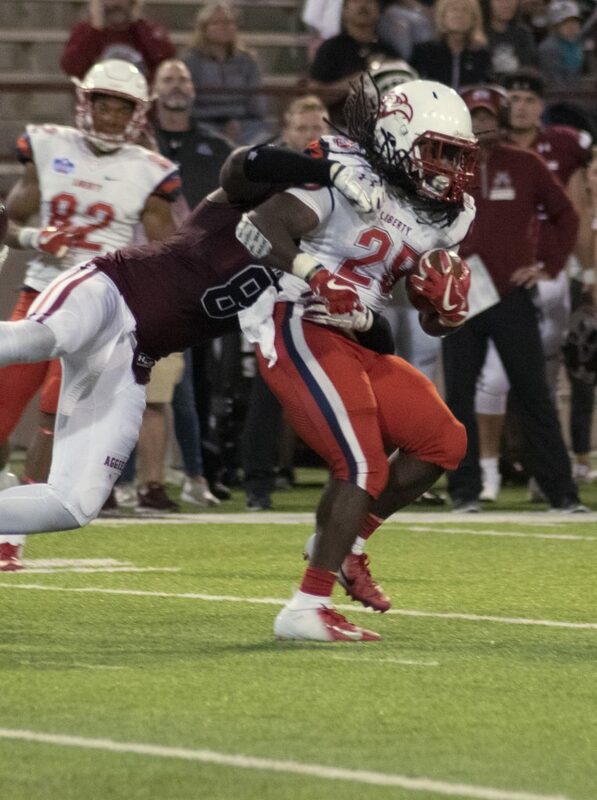 After a defensive pass interference, Josh Adkins found sophomore tight end Bryce Roberts for a 10-yard touchdown to give the Aggies a 35-21 lead over the Flames. Liberty was then able to come up with an 11-yard touchdown pass to end the third quarter, 35-28. To open the fourth-quarter, Adkins found junior wide receiver OJ Clark for a 40-yard touchdown, extending the Aggies’ lead to 42-28. Liberty was then able to march down the field and score on a 1-yard touchdown run on fourth down to make the score 42-35. 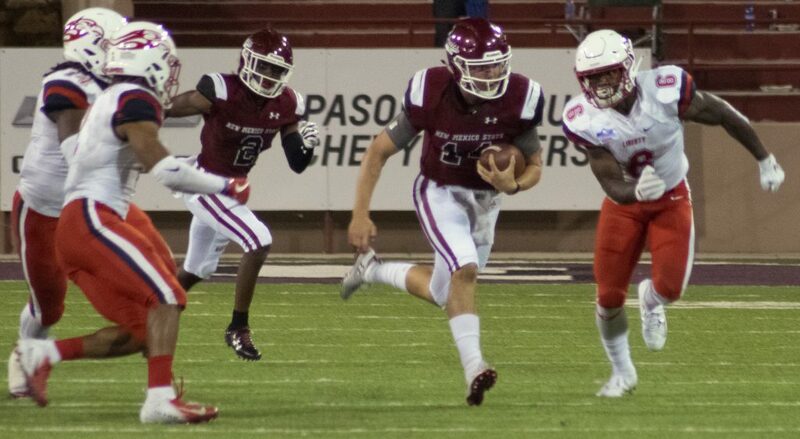 On the Aggies next drive, it seemed that Gibson was stopped short of the line-of-scrimmage, but he reversed field and was able to score on a 66-yard touchdown run to put New Mexico State up, 49-35. Liberty was able to score the final touchdown of the game with a one-yard rush. The Aggies blocked the extra point attempt, making the final score 49-41. Both teams put on an offensive clinic, combining for 1,097 yards of total offense. The Aggies finished the game with 402 passing yards and 171 rushing yards, while the Flames finished with 365 yards through the air and 159 yards on the ground. 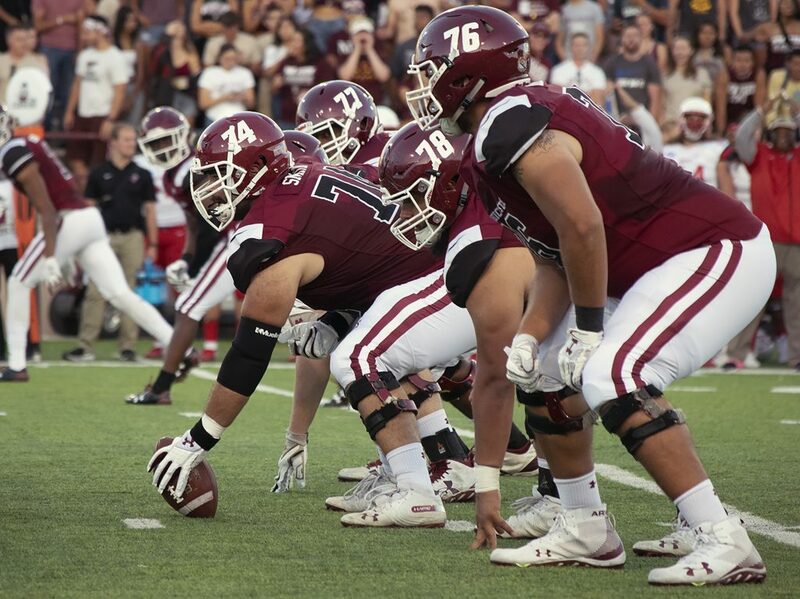 The Aggies will attempt to keep up their winning streak in Louisiana against the University of Louisiana–Lafayette Ragin’ Cajuns at 3 p.m. Saturday, Oct. 13.